The premise of Deadly Honeymoon, that is. It was Don Westlake’s idea, and I remember the evening he recounted it to me. My then–wife and I were at an upper flat in Brooklyn’s remote Canarsie section, where Don and his then–wife lived. We’d get together a few times a month, at their place or ours, and sit for hours talking and listening to records. And, as often as not, drinking something. Don and I sometimes showed each other work in progress on evenings like that. I remember reading a dozen pages, typed on the same model Smith–Corona manual portable that he’d use for the next half century, in which a man was striding purposefully across the George Washington Bridge; when a motorist offered him a lift, the fellow—Parker, by name—told him to go to hell. Indeed. Don wrote twenty–four books about Parker without ever telling us his first name; the last, Dirty Money, was published in 2008 a few months before his death. Besides showing each other what we’d been writing, we talked about what we were thinking of writing, and one night Don mentioned an idea he had: a young couple on their honeymoon, the groom beaten up and the bride raped, and the couple, rather than report the incident to the police, decide to seek justice on their own. Did he have a title? He did. Deadly Honeymoon. He told me to go ahead. There is whole lot more at the link. Make some time to read the whole page, which is filled with goodness about lesser-known Block books and his upcoming serial memoir. Donald Westlake crops up a few more times along the way. Here’s the thing—I’d always assumed, from that initial moment in Canarsie, that their revenge would be a team effort. That was the idea I thought I was stealing. But it turned out that I’d stolen that part of the idea from my own self. Never mind. I dedicated the book to Don. Least I could do. What struck me when reading this description is how much it reminded me of the brilliant but deeply unpleasant film The Last House on the Left, which came out a few years after Deadly Honeymoon. Do I have instincts? Yeah, I got instincts. 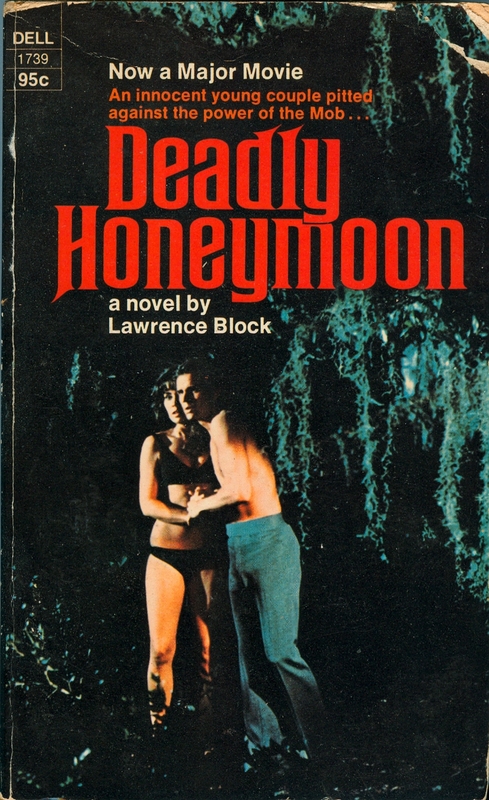 It was Henry Morrison who sold Deadly Honeymoon to Macmillan, and the ink was barely dry on the book’s first printing when he sold movie rights to producer William Castle. No end of screenwriters took a shot at adapting it, and the project just got worse and worse as it went long. The film did get made, and was released rather tentatively in 1973, with the title Nightmare Honeymoon. It starred Dack Rambo and Rebecca Dianna Smith, with Pat Hingle as the crime boss, and it was set in New Orleans, and, let us come right out and say it, it stank on ice. The formidable Elliott Silverstein, who gave us such a genuine delight in Cat Ballou, directed Nightmare Honeymoon, and I understand he thinks even less of the picture than I do. In case you were wondering, it’s not available from Netflix. And that’s okay with me. 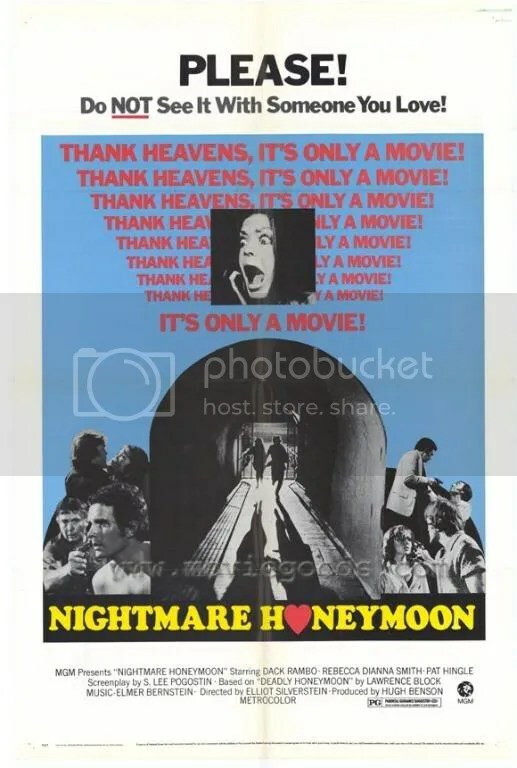 So one year after a hit movie that may have taken some inspiration from Deadly Honeymoon is released, Nightmare Honeymoon comes out, based on Deadly Honeymoon. Any connection there? Interesting that the R-rated Last House, which would be X or NC-17 today and should be, was ripped off by a movie that was PG. And also interesting that Nightmare Honeymoon was based on a book that may have been borrowed from for its hit predecessor. So we start with Hitchcock (who supposedly said “It’s only a movie” to Anthony Perkins) and Lawrence Block, and then go to William Castle (who borrowed from Hitchcock liberally and was a master of ballyhoo) and Wes Craven (who turned Hitchcock’s remark into a tagline). Then we go back to Hitchcock for the line and Craven for turning it into a tagline, Castle for buying the rights to the book, Craven for giving whoever something to rip off in order to get financial backing for the project (a guess), and Block for writing the book. Quite the family tree this movie has. ‘Tis a pity it’s apparently awful. The bigger pity is that I’ll probably watch it at some point, even though it stinks on ice. LAST HOUSE,oddly enough, is an admitted ripoff of THE VIRGIN SPRING…released the same year as the film version of PSYCHO and PEEPING TOM, and all three of those fine films getting no little censure for their violence and perversity…PT the most and PSYCHO the least, but all three.